7. 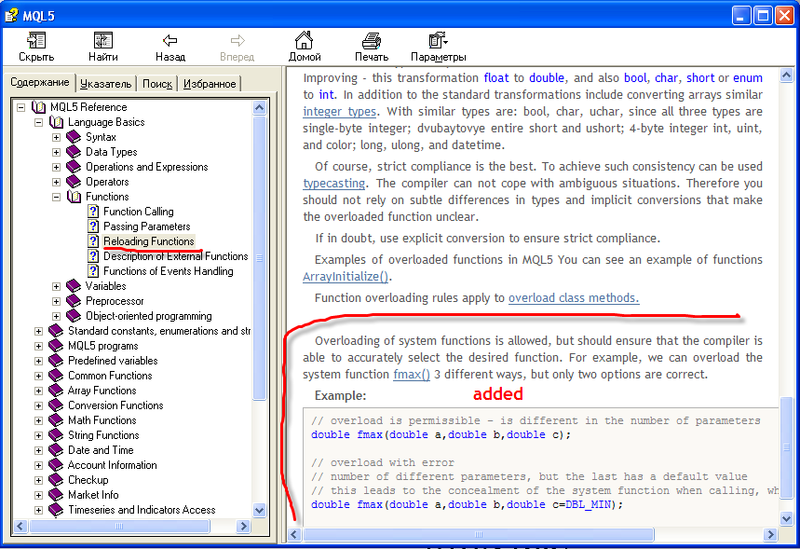 Added errors in the "Standard Constants, Enumerations, and Structures / Error and Warning Codes / Runtime Errors" section. Fixed example for the function EventChartCustom. Added description of the classes in the section "MQL5 Reference / Standard Library / Graphic Objects "
Added an example in the section "MQL5 Reference/ Basics / Functions / Function overloading"
2) MqlRates English version has Russian language in sample. 7) downloaded new mql5 reference file and can not find "MQL5 Reference/ Language Basics / Functions / Function overloading"
Thank you, it will be translated. Maybe function must be black but 'indicator_', 'ENUM_' not. We'll check it, thank you. It's OK. These words have not to highlighted.